She cracks a smile, but it is like trying to mold fired clay all over again. Impossible. Smiles are impossible for her now, she thinks, trudging through the half foot of snow on Terror Mountain. Ryian left a year ago – a distant, forgotten year ago. They’d had a fight, and he sailed off on the next pirate ship with space for a passenger. A swarm of happy, bustling pets and owners buzz around her, chatting merrily and huddling together for protection from the frigid cold. The dropping temperatures don’t worry them at all, but it’s too much for the solitary figure watching from the shadows. The figure pulls her hood up with a shudder, but her heart feels colder than the snow as she disappears through a crystal cavern into the Ice Caves. Even there, she is not exempt from the infectious cheer and joy that spreads through from Happy Valley. Even there, she is not safe from the voices of thousands of conversations from her past that thunder through her head at every moment. Even there, she can still hear her best friend talking to her. She looks away. She has no explanation. He walks away, and the guilt grips her heart and squeezes it hard. Her stomach hurts and she sinks to the ground, clutching at her heart. Hot, stinging tears of shame trickle from her eyes. The voices talk to her, shouting at her, and blaming her. She can’t take it anymore, and she detours from the path in the Ice Caves and vanishes around the corner in a graceful movement of sweeping cloak. She appears in a hidden chamber, a pathway with icicles hanging from ceiling and her face reflected each one. Her breath comes out like a Draik’s, like hot fire blown from a forge, only this time it’s cold. Ice cold. The reflection in the icicles is not the girl she used to know, but a stranger who has seen hardship and pain and lost their most beloved possession. And reflected in the stranger’s face is such immense sadness that she feels that she is not the stranger, but the stranger is standing next to her, not her. Not me, not me, not me. It’s you. It’s you, Sarah. How could you? “Stop talking to me!” she shrieks, ripping off her hood and pelting through the Caves without any regard for her personal safety. But the reflections flash by in the glittering ice, all whispering the same words over and over again: It’s all your fault. Somewhere, not in a beautiful, off-track ice cavern, the sun beats down on a red and black striped bandana, and beneath the bandana a Pirate Kougra is gripping the railing of his ship, squeezing until his knuckles are white. Somewhere, in the complete opposite of Terror Mountain, is a very different time and a very different place and a very different person. But it turns out the saddened figure running through the Ice Caves and the shadow clutching the railing of a proud ship gliding through the waves of the ocean near Krawk Island’s coast are not that different after all. Connected by an irreplaceable bond that neither of them can cut, no matter how hard they beat at it or shield it behind invisible barriers in the back of their mind. And the Pirate Kougra slowly releases his grip on those barriers and let the memories wash through, a relentless pour of voices and memories from the past that he wishes he could forget. Bowing his head over the railing, the Kougra begins to cry. It happened such a long time ago that neither of them remembers the story properly, because they have tainted their memories with might-have-beens: should-have-beens, sadness, anger. What really happened was this. It was his birthday today, the blue Kougra thinks to himself, watching the sun cast rainbows of iridescent light on his ceiling through the stained glass window of his bedroom. It’s his birthday today, and today he is unstoppable. Today there will be a cake waiting for him, today he will have presents, today he will have a party and today they will go to Kelp in Maraqua and celebrate this very special day. Shaking with excitement, the blue Kougra enters the kitchen and looks for the cake and the balloons and the presents. The blue Kougra rushes upstairs, thinking that there must be some sort of mistake, because Sarah would never, ever, forget his birthday. He pounds up the stairs, making sure to hammer this statement into every single one of them. He very gently pushes open the door of his owner’s bedroom, expecting her to be gone, shopping for his birthday or handing out invitations to all their friends. He closes his eyes, just in case she’s hiding his present in his room. “Sarah?” he whispers into the dim light. There is a figure hunched over her desk, weeping. Creeping closer, the Kougra thinks to himself, ‘This isn’t her. She must have been kidnapped or something, because Sarah never cries. Sarah is my hero.’ But she is. The brown hair is unmistakable – the light gray eyes are even more proof. But for those gray eyes to be filled with tears is something unknown to the blue Kougra – it’s strange, it’s frightening, it scares him. Then he steels himself and tells himself that nothing can harm him on his birthday. This is his day, and his day only. “Sarah?” he whispers again, hesitantly tapping the figure on their shoulder. The figure spins around slowly, revealing herself to be clutching a well-known photograph, in that familiar frame he made out of ice cream sticks and macaroni. “I’m sorry, Ryian,” she says quietly. Edging closer, Ryian the blue Kougra finds the photograph to be the one he was thinking of – him, so long ago, gap-toothed and grinning, standing next to a beaming girl with chocolate hair and storm-gray eyes as she holds up a much-coveted trophy for her first article in the Neopian Times. She has one arm thrown around him and the other holds the trophy triumphantly in the air, and he’s there too, pretending like he’s helping to hold the trophy as he reaches up for it with his short, short arms. The blue Kougra cherishes that memory and knows that his owner’s spectacular skill at writing was what got them to their comfortable lifestyle in the first place. It was the discovery that brought them out of poverty, and it was the discovery that got her saving for the Paint Brush. To be Pirate was one of the Kougra’s greatest wishes in life: he so loved the pets, with their banners of grey and red and white, and he so longed to belong as one of them. 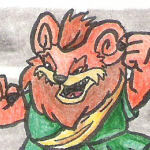 Garin the Usul was one of his greatest heroes, next to his owner. Thinking of this Paint Brush, a terrible thought pulls at the edge of the blue Kougra’s heart. But he refuses to allow himself to believe it, and he looks up at his owner, the greatest hero in his life, the image of shining of perfection that he strived to be, and searches for the answer in her eyes. But he doesn’t like what he sees, so he avoids the swirling marbles of storm gray that glisten with unshed tears. “What... happened, Sarah? It’s my birthday today,” he probes, saying the last sentence to give himself some sort of confidence. “It’s all gone. It’s all gone because I lost it,” she says apathetically, staring down at her quivering pet. And it sinks in – it doesn’t sink, it hits him hard, like someone’s been throwing heavy projectiles at him for the last hour and he’s already been hit too many times. The breath is knocked out of him for a second and he actually believes the truth he found in her eyes – and then he goes back into his state of denial, because he knows that if he allows himself to believe the words she speaks his faith will crumble. He backs away, shaking his head. “No! You stop lying! That’s what happened!” she shrieks, standing up and pointing a finger at him. He knows that she loves to play on luck, enjoys a good gamble with chance. He knows about her fetish for buying scratch cards and scratching them diligently in the hopes she’ll strike it big. He never knew that she’d take it this far. To gamble away his hard-earned Paint Brush money on silly games... what sort of owner does that to their pet? Oh yes, he reminds himself, Sarah would. The mental pedestal he’s placed her on in his mind is now made of brittle leaves and twigs. It just doesn’t hold up. All faith he ever had in her collapses, implodes in on itself and disappears. And simultaneously, his heart breaks. And he walks out the front door, leaving her in darkness. He runs. He runs and he runs and he runs, he runs until he is no longer Ryian the blue Kougra and it is no longer his birthday today and he no longer belongs to a gray-eyed girl named Sarah. He runs until he comes to the Pound. For a moment he considers going in there and asking to be taken in, but one glance at Dr. Death’s malevolent eyes makes him think otherwise, and he runs past the Pound, too. He runs to the bank and withdraws money from their account, which, sad to say, is terribly little after his owner’s spending spree the other day. He runs until he comes to the Food Shop, where he buys sustainment for what he knows is going to be a long trip. It will be a hard one to make, and he may never come back, but then again, he’ll never need to. He runs until he reaches the docks, he runs until his feet are sore and he cannot feel them anymore through the blisters that have sprung up from them from years of not using them to run for so long. He runs to get away from it all, and soon the waves lick away the pain and tiredness from his aching feet and he is able to purchase a ticket on the next ship out of Neopia Central. The old Gnorbu who is selling tickets looks at him suspiciously as he explains that he wants the cheapest one possible, but when he provides him with a cover story (cleverly thought up as an errand for his owner), the old Gnorbu consents to allow him passage on the S.S. Windbreaker. Saying a hasty “thank you” and looking behind him to watch for the signs of any approaching pets, and seeing none, he boards the ship. Granted, he attracts much unwanted attention from curious bystanders of the crew, but it’s cheap, and though it’s uncomfortable sleeping among coils of scratchy rope and burlap sacks, he looks to the stars and silently asks them to wash away the memories and lies that have filled his mind. The stars concur and soon all the things that happened on his birthday can never be recalled to the blue Kougra. He is a stowaway on the ship for many, many days – more than he can count – as he flees from his past, and the lies that the past holds. It’s too painful to face, and he can never face it because he is a coward – a coward who will never have another home again. But it doesn’t matter, because he’ll make himself a home. He resolves to this goal, and takes it upon himself to disembark at Krawk Island. And there he has a trade, and his trade is repairing things. But to be a repairman for his own past would be quite a feat in itself, because he’s probably so damaged the bond they have that it’s probably disintegrated and dissolved into nothing. But then again, he reasons to himself, it was her fault in first place. Standing at the bow with the wind blowing back his new Pirate fur, he revels in his newly built ship. Besides being a repairman, he has evolved into a fine craftsman in six months’ time. He worked for his Paint Brush, and he takes pride in that fact. It was payment for an especially difficult job a client had given him. He had always been on the move – traveling from world to world for a year, always under some alias so that he couldn’t be tracked. Fyora knew his owner was looking for him – she needed him so that she could use him in the Battledome. And slowly, the truth becomes clearer to him. As a young child, he could never understand the saying “you can’t see the forest for the trees”, and now he comprehends it perfectly. The image of perfection that Sarah was is shattered, is now riddled with so many faults and imperfections that he himself looks like the very thing he’d once wanted to – no, she’d wanted him to be. She’d had many of these fine, hairline cracks that ran down the mirror he’d always envisioned her being: a penchant for the Battledome, for brutal violence and horrid beatings. A tendency to overspend their tight budget so that his purchase of the Paint Brush was always pushed back another month or so. A habit of procrastination, of putting things off until the last minute so that her work always turned out a mess, sloppy and disorganized. And such was his life until now. The blue Kougra (but no longer a blue Kougra) is now the captain of his very own crew, feared across the Neopian Sea as a fearful pirate. Someday, perhaps, he’ll earn the fame that Garin once owned. Granted, he’d even seen and talked to his former hero up close, but he’d seen all the faults Garin himself had, though they were not as obvious as Sarah’s. And in the midst of all this fault-finding and self philosophy, the now-Pirate Kougra overlooked one very important thing: in spite of all her shortcomings and weaknesses, Sarah had still loved him. At first, Sarah had told herself that it was all her fault that she’d lost her most beloved possession. He’d run away because of her, and on his birthday, too. She’d spent all morning chasing him around Neopia Central, following the tracks he’d left for her to find. But eventually the path was lost, and she’d given up. Two months later, while her own Kougra was beginning to understand the saying “you can’t see the forest for the trees”, she now understood its complete meaning, though she’d probably never know what it symbolized for everyone. She’d straightened up the house, and had discarded all her pictures and photographs except for one: the shot of her, Ryian, and her first Neopian Times trophy. Those now sat in the basement, neglected and dusty. She’d once coveted them so, buying special cases and dusting them with specially manufactured cloths each day, but now she realized what they actually were: cold, golden statues with no real purpose in life but to mark a significant achievement. Memories last the longest, she’d thought to herself as she locked the basement door and vowed to never pen another article again. Her spring of inspiration had dried up shortly after Ryian’s departure, and she found herself twitching the pen absentmindedly, her thoughts wandering to other things. She’d tried her hand at games but proved to be useless at mastering the art of either trying to hit a stuffed Kass figure far enough to advance to the next level, or getting as many Neggs as possible. She’d ended up poorer than she’d started and became a daily visitor to the Soup Kitchen. It was when she’d decided to sell her house that Sarah really regretted what she’d done. It hadn’t been all her fault, but partly Ryian’s for running away from his problems when he should have stayed and faced them. It was with this sudden comprehension that Sarah traveled to Terror Mountain, hoping that maybe the biting cold would numb her enough so that she couldn’t feel so heartsick anymore. The despondent, apathetic gray-eyed girl had trudged across and through the entire mountain, and a pair of blue lips was enough to testify her claim. More than once Taelia had found her weary and sore, unconscious somewhere in the freshly fallen snow. It was here, by Taelia’s fire, that the grief-stricken wretch found herself next, having lost the ability to speak after wearing out her voice from so many hours of screaming at her reflection in the shimmering Ice Caves with their glassy sheen. The kindly Snow Faerie only shook her head sadly at the woebegone once-owner, knowing that the only person who could cure a broken heart completely was the one who’d broken it in the first place. But unless one of the two had a complete change of heart and mind, it would never happen, and she’d find Sarah in the snow, every single day, for many, many more years.